Congratulations to P. Brinton who placed the winning bid of $2,000 for January's silent auction painting "The Terrace, The Early Snow", by Victor N. Butko, estimated at $3,500- $4,500. 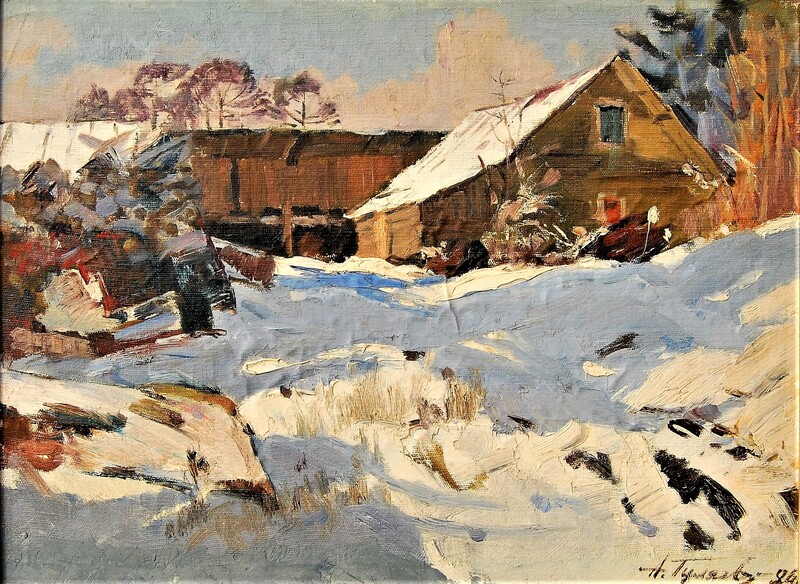 This month we present as the auction painting "March" by one of Russia's great landscape artists, Alexander Georgievich Gulayaev. Alexander was a long time friend of the gallery and a regular host for our art trips to Leningrad/St. Petersburg during the early 1990's. Inevitably, our art buying entourage would drop by his city center studio on the top of a 12 story high rise in magnificent St. Petersburg. There Gulyaev was a delightfully hospitable host. He would always prepare for our arrival by slicing some salami and home made pickles which we soon washed down with a toast of vodka -- or several. Alexander Georgievich spent his childhood summers on the Barguzin River. It is more than 300 miles long and one of the most beautiful and pristine in Russia. The Barguzin River flows into Lake Baikal, which has the largest volume of freshwater in the world, containing roughly 20% of the world's unfrozen surface of fresh water. Lake Baikal is also the deepest lake in the world at 5,387 feet. Alexander Georgievich, a bit of a historian noted that lake Baikal is also the oldest lake in the world at 25 million years. Alexander Georgievich had special fondness for this part of Russia. His love for the landscape is evident in the works he painted here. Alexander Georgievich saw magic on the banks of the lake and river and never got over his excitement for the Lake and the topography. In the painting, "March", Alexander Georgievich portrays a riverside dacha where the Barguzin River meets the largest Bay on Lake Baikal, Barguzin Bay. The spot is a favorite place for boats to meet and exchange cargo. Estimated at $4,000 to $5,000, the current high bid is just $2,250. The next bid is $2,500, followed by minimum bidding increments of $250. Remember, there is no reserve, at the end of the auction the high bid wins! To ensure you don't miss out on a great painting due to a last minute bid, be sure to place a maximum bid. 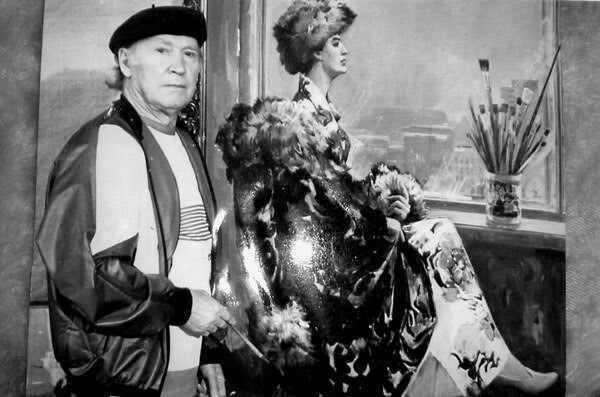 Aleksander Georgievich Gulyaev was born on September 11, 1917 in Rubtsovsk, Altai Territory. In 1932, Gulyaev graduated from middle school and the following year entered the Tashkent Trade School of Arts. After studying under A.N. Volkov, V.P. Markova and M.I. Kurzin, Gulyaev progressed in 1937 to the Russian National Academy of Arts (Repin) Institute of Painting, Sculpture, and Architecture in St. Petersburg. There he studied under the instruction of E.M. Cheptsov, I.P. Stepashkin and L.F. Ovsianikov. Gulyaev voluntarily joined the Red Army in 1941 to fight the Germans in W.W.II. He received the Patriotic War Order and eleven medals, including the Labor Veteran Medal, for his service during the war. After he was wounded, Gulyaev was demobilized in December of 1942 and resumed his study at the Academy of Arts. Gulyaev graduated from A.A. Osmerkin's workshop at the Repin Institute in 1946. His Diploma work was a painting "Minn and Pozharsky" that now belongs to the Academy of Art. In the same year he entered the Leningrad Union of Artists. Soon afterward, he became a member of the Russian Artists' Union. Gulyaev participated in numerous national, republican, zonal and local exhibits in St. Petersburg. Gulyaev began exhibiting while still a student, taking part in summer exhibitions from 1939-41, then at an exhibition of Diploma works and at the Union of Artists after 1949. Gulyaev exhibited in All-Russia, Republican, Regional, local spring and summer exhibitions. He also took part in "Our Contemporary" exhibition, dedicated to the Soviet Army and breakthrough of the Leningrad Blockade. For his painting "On the Direct Line" ("? ??????? ???????") he was nominated for the Stalin Prize in 1953. Gulyaev's works are held in museum collections throughout St. Petersburg and Russia, as well as in many private collections in Russia and abroad, including the Pavlodar Art Museum, Vladivostock Art Museum, Turkemenian National Art Gallery, Museum of Revolution in Leningrad, Baltyisk Arine Museum, Museum of Radio Communications, Art Fund Collection of Russia, and the Ministry of Culture and Astronomy Institute in Leningrad and the Springville Musuem of Art. He was awarded twelve Government Medals and Orders. 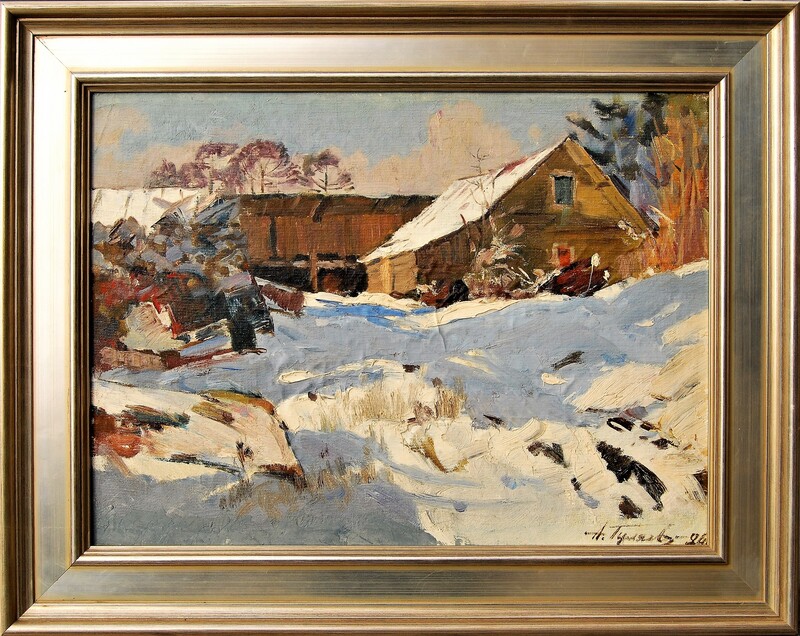 Gulyaev's paintings are often sold through international auction houses such as: Sotheby's, Arcole (Paris), Blache (Grenoble), Phillips (London), Bonhams (London). Aleksander Georgievich Gulyaev died in1995.